A rare – possibly unique – combination: romantic novel meets Everest ascent. 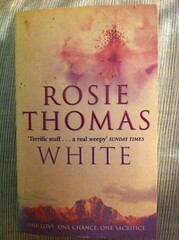 In Dr Finch Buchanan’s choice of Into Thin Air as her inflight reading at the start of the novel, Rosie Thomas acknowledges what I assume was her inspiration – the 1996 Mount Everest disaster. Her own experiences as traveller, mountaineer and skier feed into Rosie Thomas’s narrative, in the emotional pull of the high mountains, the motivations of those who go there – to trek or to climb – and the experience of being in remote places where nature is at its most harsh. If you’re wondering about any or all of three aspects, read this book. As a female mountain traveller and trekker, they really resonated for me. The love story? Not so much! Harry Hole is sent to Bangkok to investigate the murder of the Norweigan Ambassador in a brothel. What could possibly go wrong? Walton weekend book No. 3. Well, started in Walton. Finished in London. A quick and easy read – I’ve said it before but I’m not enjoying Jane Green’s novels as much now they’re based, like her, in America. I didn’t warm to the lead characters – long-abroad Brit, Gabby and solid, professional, husband Elliott. She was too oblivious to the obvious, which results in a one night stand followed by the longed for third child, his realisation that he still loved her as soon as he held the not-longed-for baby. Office affairs, EC2 style…. convincingly told by FT columnist Lucy Kellaway.